This Industrial iPad Stand Accommodates 9”-10” Tablets! This Digital Notebook Mount Features a Locking Enclosure! 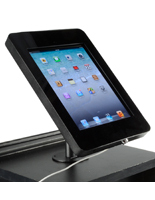 This Industrial iPad Stand is Great for Store Fronts! Locking enclosure with key for exclusive access to devices. Optional hardware to screw base to countertop for a stationary holder. Tilts 180° for alternative viewing angles. 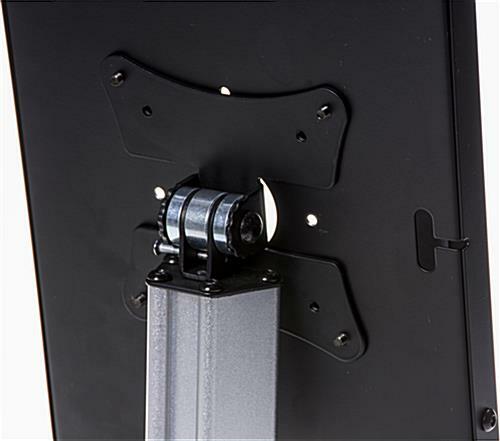 Rubber-lined bracket to ensure technology safety from scratching and cracking. Card reader accessible for commercial use. Home button exposed for full access to devices. Power/locking button exposed to easily turn devices on and off. Landscape or portrait orientation for alternative perspectives. Charging port exposed in portrait orientation for easy power access. Head phone jack, speakers, and camera exposed for additional features. Assembly required with included hardware. 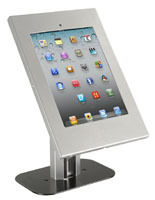 This industrial iPad stand, such as a media display, is great for presenting graphics in public areas. 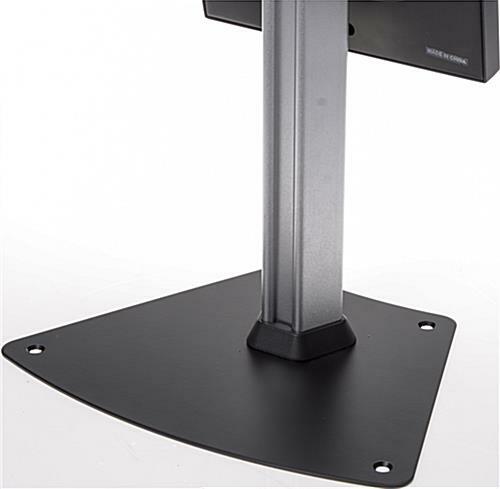 Each counter mount stands at 19” for an ideal viewing perspective. 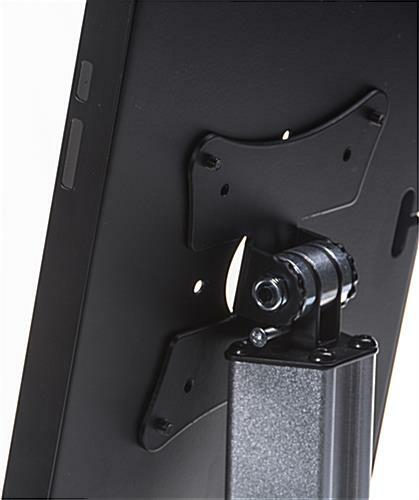 This industrial iPad stand that is black can tilt 180° for different angles per individual comfort. The home button is exposed on this tablet mount for full access to all digital notebook software. 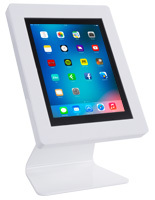 This industrial iPad stand that fits 9”-10” products can hold tablets including Apple® generations 3, 4, and the iPad Air. The bracket features an exposed camera, charging port, and is credit card reader accessible. 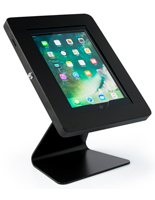 This industrial iPad stand for store fronts can easily replace a cash register to refurbish a retail boutique and keep up to date with the latest technology trends! Each Apple® tablet mount is a secure fixture. 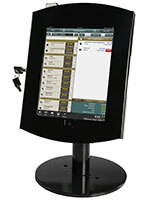 This floor standing tablet kiosk, industrial iPad stand features a locking design. The enclosure of this mount locks by key for easy access to the technology only by the owner. This industrial iPad stand that is a quality design can also lock to a countertop with the included hardware for extra security. The design of this countertop kiosk allows for complete use of the technology while remaining a safe and stationary fixture for commercial and public display. 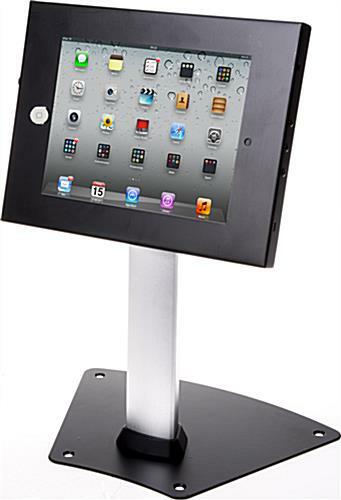 This industrial iPad stand securely holds an Apple® tablet! Use this mount in a store front, hotels, restaurants, or in an office to display graphics, products, or company information. 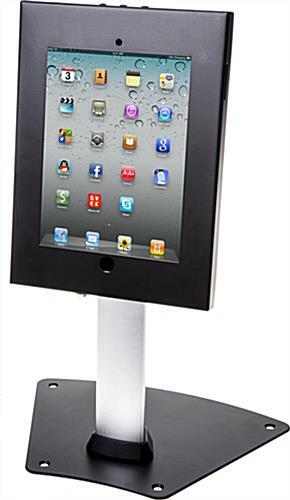 This industrial iPad stand for Apple® products is a smart choice for commercial use! 12.3" x 19.0" x 20.0"